"Open" has gone mainstream. The world now celebrates Open Education Week. The U.S. Department of Education announced an "Open Education" or #GoOpen initiative and ran its first "@GoOpen Exchange" to get schools and educators committed to the use of open educational resources (OER). Students at Ithaca College, The College of William & Mary and Santa Barbara City College are all pushing their schools to adopt OER. Multiple colleges and universities are trying out no/low-cost OER degree programs. Amazon looks to be getting into the OER business with "Inspire." And a bipartisan group of Congressional staffers recently held a briefing to learn from experts why they should care about OER. The demand for free learning content may be loud and clear now, but, back in 2013 when Campus Technology first surveyed the top sources for free digital textbooks, the OER world seemed a quieter, less tweeted place. What hasn't changed, though, is that faculty and students still want to know where to go to find the goods. The following list offers 15 sources of quality digital content to use in your courses without worrying about the price tag. 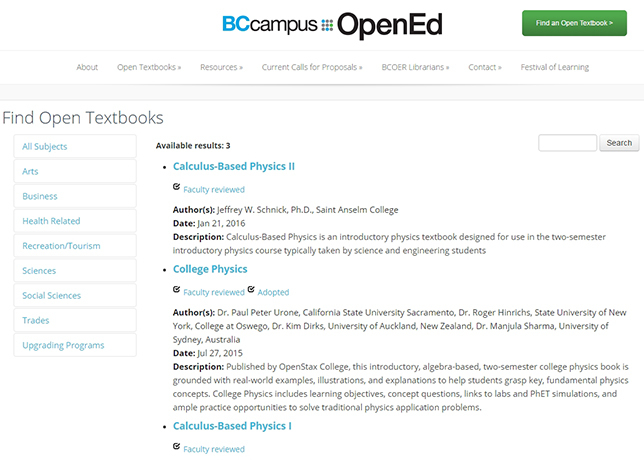 In 2012, the province of British Columbia announced the "BC Open Textbook Project" and designated BCcampus to create a collection of open textbooks that could be used in the top 40 highest-enrollment subject areas. While many of the books and their ancillary resources have been adopted from other sites, the initiative has also produced its own OER textbooks. In many of the categories, BC faculty have reviewed the resources to give the local perspective. 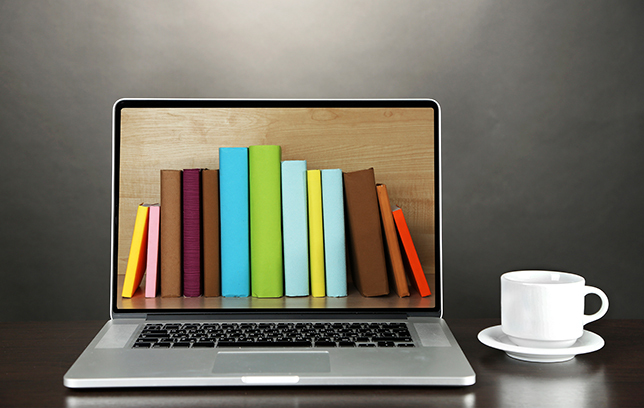 This collaborative effort among education, nonprofit and for-profit organizations affiliated with 200 colleges has set out to build OER awareness within two-year colleges. The site has peer-reviewed more than a hundred OER textbooks and provides links for hundreds more. COT isn't a repository, but its links to free textbooks by subject run from anthropology to statistics. Started when a group of educators created a Wikibook, this English and Spanish language collection includes some unique titles under-represented by other sources, such as CIO Handbook, Data Mining for the Masses, Game Programming and Practical Plastic Surgery for Nonsurgeons. 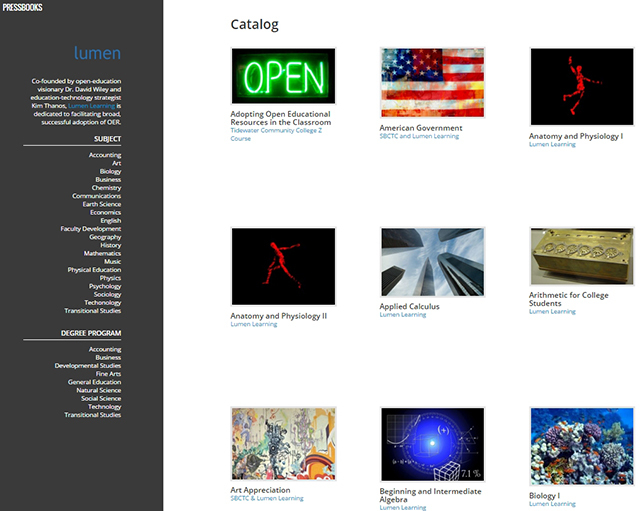 Overseen by influential OER activist David Wiley, Lumen's Candela Learning catalog offers links to its own content as well as the content developed by institutions it has worked with on OER initiatives, such as Tidewater Community College and Washington State Community and Technical Colleges. The content isn't technically downloaded as a file; it's made available in HTML format, which can be accessed through a school's learning management system. The granddaddy of OER, managed through the California State University System, is looking mighty sprightly. The current catalog offers nearly 29,000 science and technology resources, 4,600 resources for math and statistics, 8,300 results for humanities and 9,400 for education. That doesn't count the arts, social sciences or workforce development. It should be noted that these aren't all textbooks. You'll also find plenty of case studies, assessment tools, online course modules, journal articles, quizzes, simulations and tutorials. Look for the "Merlot Classics" icon for particularly exemplary models. While this university site is known for its open courses, it also includes an online textbook page with links to the textbook files used in the courses. It's especially useful for finding course materials in areas where OER is sparse: civil, electrical, environmental and mechanical engineering; material and nuclear sciences; and aeronautics and astronautics, among other subjects. The nonprofit Institute for the Study of Knowledge Management in Education, based in Monterey, CA, launched the Commons in 2007 to share content "from around the world." The 64,000-item collection covers curricula from preschool through adult education. Users can filter based on education level, subject, material type, conditions of use, content source and other criteria. Within the college level, resources tagged as "textbook" top out at just under 600 results, many culled from the other collections referenced here. Started by an associate dean at Stanford's continuing studies program, this site brings together a curated "meta collection" of free textbooks taken from many of the other sites included in this article as well as other pockets of the web where a faculty member has put digital textbooks together for his or her courses and made them openly available. Open Culture also provides collections of free online courses, movies, audio books and other forms of education content. The latest publication in this pilot effort by the State University of New York libraries is Writing in College: From Competence to Excellence, which joins 14 other titles written by faculty and published by the libraries. A consortium of higher ed institutions and systems has networked to support the use of OER within their programs. Supported by the University of Minnesota Center for Open Education within the College of Education and Human Development, the library of textbooks pulls titles from multiple sources, including many others in this list. When we first looked at this organization, which launched from Rice University, it had 13 titles. That has grown to 22, covering topics from anatomy to sociology. Its stated goal: to provide free textbooks to 10 million students. 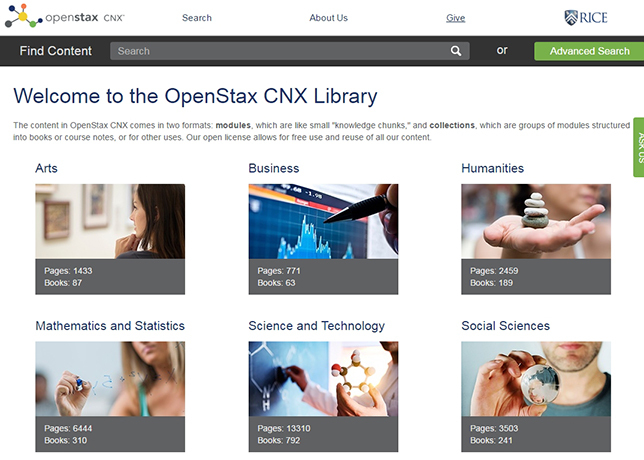 In addition, its parent organization OpenStax CNX is an open library of learning objects that are both organized into books and available as "pages" for compiling and mixing into custom curricula. This effort to digitize cultural works has been plugging away at its mission since 1971, when it undertook the creation of an electronic version of the Declaration of Independence, item No. 1 in its collection. Most of the contents are public domain books — both the obscure and the beloved. On any given day nearly 100,000 copies of books are downloaded from the site. Although better known for its free courses, this online education organization also makes the curriculum from each course available in downloadable textbook form by anybody. This collaborative project focused on STEM topics invites students and instructors to develop content such as labs, homework and worksheets, which is then shared with everybody in an open manner as a textbook replacement or "wiki-text." Specific instructors may maintain their own mashups of the wiki content for use in their courses with links through the site. 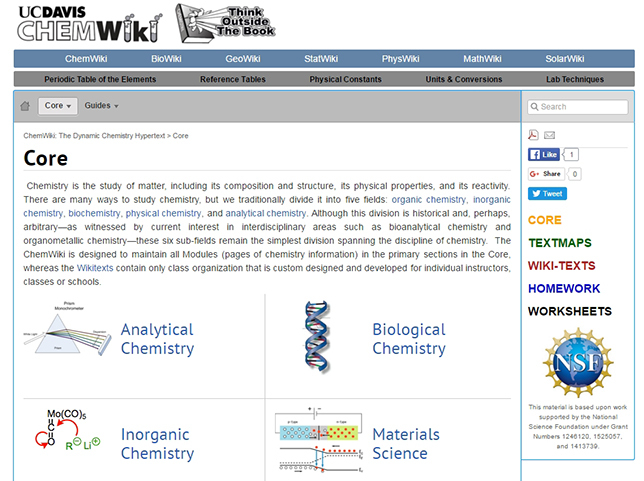 Currently, wikis cover chemistry, biology, geology, statistics, physics, math and solar. The work is directed by chemistry prof Delmar Larsen. Promising "open books for an open world," this site, which is hosted by the Wikimedia Foundation, offers 2,900 textbooks, categorized by subject, completion status and reading level. Many of the books are available for download as PDF files. Bay College Library currently has three faculty-written OER textbooks: one on career exploration and two on U.S. History. Green Tea Press is a collection of free textbooks on programming by Allen Downey. This professor of computer science at Olin College of Engineering in Massachusetts proclaims in a manifesto on his site, "Students: You should go on strike. If your textbook costs more than $50, don't buy it. If it has more than 500 pages, don't read it. There's just no excuse for bad books." The first edition of Introductory Financial Accounting by accounting professor Anthony Cataldo II at West Chester University (PA) was written while Cataldo took a sabbatical. Now he's publicly asking for help in correcting typos and making improvements. Noba focuses solely on psychology topics. The brainchild of two educators, Ed and Carol Diener, who founded a nonprofit expressly for the purpose of building Noba, offers "ready-made textbooks" as well as 93 learning modules that can be pulled together for a specific educational use. Scottsdale Community College Math Department faculty have written four math textbooks and final exam reviews and made them available for download. Did we miss a site? Add a comment below with details and share your resources with the education world.